In sports anime, characters have to learn that their failures don’t define them—or their place on the team. Once they learn they are unconditionally accepted, valued, and forgiven, they’re able to play without any more pressure than necessary. I’ve noticed this often on Haikyuu! !, but the most recent episode struck me in a slightly different way. 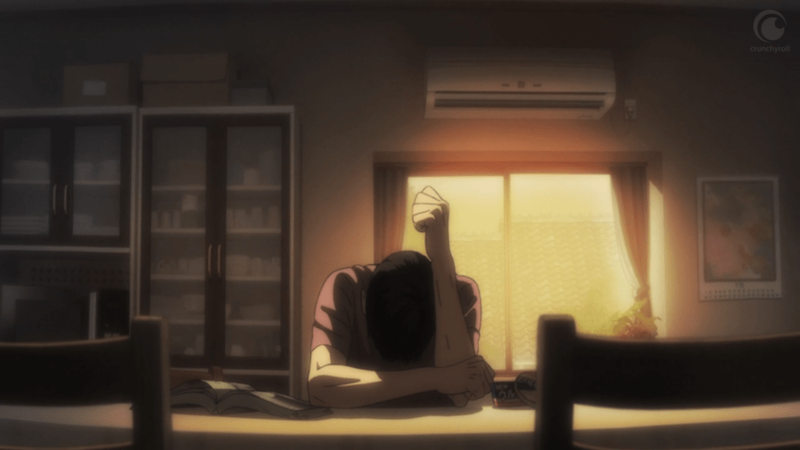 For Ennoshita, Tanaka, and Yamaguchi, it’s essential to deal with their guilt—whether real or just perceived—in light of the team’s real feelings and their own abilities. Only then can they boldly fulfill their roles on the team. This pattern is a familiar one, one that applies well in real life—Christians must go through a similar process of embracing their security in God’s grace in order to serve him boldly. Ennoshita Chikara is a coward—or at least, that’s how he sees himself. As a first year, he ran away from the old Coach Ukai’s brutal training for several days. He came back to practice because he felt he was better off with volleyball—pain and all—than without, but ever since, the thought of running away has remained close. Because of this, it’s hard for him to see his own potential as a leader. Ennoshita holds his past “cowardice” against himself, but no one else does. When he came back after skipping several days of practice as a first year, Daichi and the others welcomed him back to practice without hesitation—along with two other “runaway” first years who followed him back. A year later, his fellow second years—including the more steadfast Tanaka and Nishinoya—consider him to be the best one to lead them. He already keeps the crazy members under control. They trust his steadiness and feel his cautiousness gives him perception of the needs and doubts of other members, a perception they lack. He doesn’t agree with them yet, though—he still carries too much doubt about himself. I admit, I’ve so underestimated Ennoshita, I forgot about him until the end of last week’s episode. He’s a minor character, and his actions, height, and hairstyle make it easy to mix him up with the team captain, Sawamura Daichi. In fact, he’s only getting my attention now because Daichi has been injured and they need Ennoshita to fill his position. Now Daichi, the captain who held the team together mentally and filled in for his teammates’ weaknesses, is out of commission. The other level-headed third year, Sugawara, is on the sidelines, since Kageyama is the best setter for the current situation. Ennoshita, usually a benchwarmer, is the de facto leader. Ennoshita comes on court with no real game experience, and as the game starts back up, he wrestles with the urge to back down and “run away” by playing it safe. But he remembers that nothing good comes from running away, and so he stands firm. He’s confronted his own cowardice often enough to play with minimal hesitation. He might not see his value as a leader yet, but he recognizes two things: he needs to be on the volleyball team, and he was put on the court because he was the best one for the job. Meanwhile, Tanaka is still shaken up about his and Daichi’s collision. Sure, Daichi already claimed responsibility for running into him, but the normally rambunctious second year still feels bad. “Breaking” his captain—the team’s solid foundation—could be enough to crumble Tanaka’s usual mental strength. He apologizes to Ennoshita, who immediately tells him, with backup from upperclassman Asahi, that they’re just glad Tanaka wasn’t hurt, too. This is important, because if Tanaka blames himself, he will falter on the court. The team needs him to be his usual bold self. Ennoshita understands mental weakness, and this makes him an ideal encourager—but not everyone on the team is as easy to deal with as Tanaka. Yamaguchi Tadashi comes in as a pinch server. 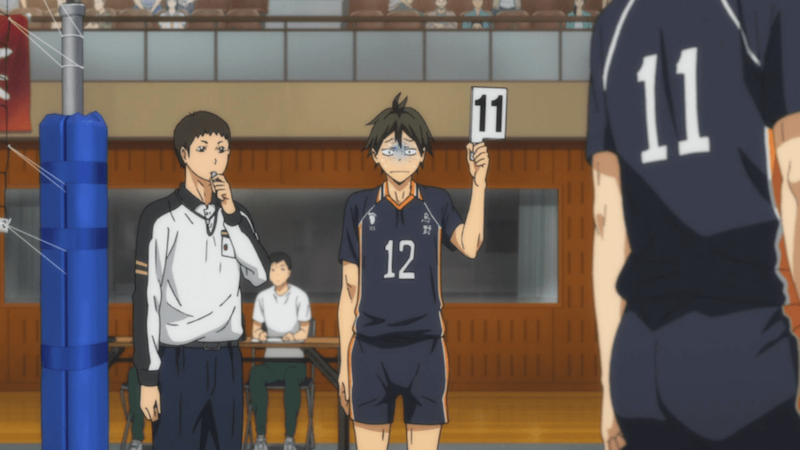 The next test comes with Yamaguchi Tadashi, a first year who rarely plays in real matches. He’s learned a floating jump serve—his only great asset at this point—so he’s called in as a pinch server. His first serve barely makes it over the net, and he remembers a time that he didn’t make it at a crucial point for the team. So he doesn’t jump for the next serve. He just does a normal floating serve—still not easy to return, but not nearly as difficult as it would be with a jump. Their opponents return it, and he freezes. His legs won’t move when the ball comes toward him. Ennoshita has to cover for him. That serve is Yamaguchi’s only real weapon right now—his only tool to play on the same level as his team. Yamaguchi “runs away” in a different way than Ennoshita does, but the upperclassman understands it—he knows the fear of failure and the shame of backing down when everyone else is boldly fighting. Yamaguchi doesn’t need scolding. He probably needs to process what just happened, remember that he has a team of talented friends to back him up, and then have a second chance to serve boldly. I don’t think Yamaguchi ever fully processed his last failed serve. If he had, maybe he’d realize that the team isn’t asking him to make every point—only to serve boldly. They’ve made their share of mistakes, and they’re used to covering for one another or making up for lost points. And they want him to succeed not only for the team’s sake, but for his own. They’ll forgive him for backing down on this serve, too—but until he learns to accept that grace and try again, it will be hard for him to move forward. I hope to see him grow in this over the next couple episodes. Christians have a similar pattern of growth. God asks us to be bold, not because we’re perfect, but because he is perfect. He knows our faults—past, current, and future—but he accepts, values, and forgives us. And he’s given us much—individual talents and qualities, salvation from sin and death, and the promise of being molded to be more and more like him. It’s essential for us to understand our weakness, and from there, to learn what God has given us and embrace his unconditional gifts, so that we may live fully, confidently as part of his team—and extend the same grace (favor, blessings, forgiveness) to others. Maybe you’ve walked away from God, like Ennoshita walked away from practice. God’s way is often hard, even painful. Others seem to have it easier—they don’t serve anyone but themselves. Their lives may feel empty at times, but there are ways to distract themselves from any longing for something more. Maybe you only intended to push your relationship with God to the side a little, and you didn’t even realize it at the time. Before you knew it, anime or video games or work or school took up most of your time, and you mostly avoided thinking about God. I’ve been in that place all too often. In some ways, it can seem easier, but something about a selfish or worldly life doesn’t feel quite right. It lacks the sense of fulfillment that comes from abiding in God’s Word in thought and action. Ennoshita misses volleyball practice after his days of lazing around. You have two choices once you realize this: you can ignore the longing, or you can turn back to God. He welcomes us back with open arms, but it has to be our choice. And it’s difficult to get back into it, just like Ennoshita probably felt extra challenge after taking time off practice. I know when I haven’t read my Bible consistently, I feel a dull thirst for it, but my passion has faded, and it’s a struggle to get through even one chapter. When I’m used to living for my own desires, it’s difficult to give my time back to God. But it’s worth it. Don’t let guilt hold you back from God. Confess the guilt, yes—to God and perhaps to another Christian. Confront it. But accept God’s forgiveness. Accept his grace. I say this to you, and I say it to myself, because it’s a daily struggle. Like Ennoshita, I find that the desire to “run away” is almost always present. I’d rather live the easy life, and I often make the wrong choice. I’m learning to keep coming back to God, and to trust that when he opens opportunities for me to serve or lead others, he knows what he’s doing. At times, I’m more like Yamaguchi than Ennoshita. I have an opportunity to use the gifts God has given me to serve others—perhaps speak truth into someone’s life, or show love for someone through conversation, gift, or note. (Writing notes is especially intimidating for me—I’ve received several encouraging notes from classmates at college, but I don’t think I ever sent more than one in return.) Perhaps the opportunity even takes the form of a job application. Instead, I freeze. Maybe I still act, but I don’t act with boldness, and I miss out on an opportunity to do something really special. Or I do act boldly, and I mess up. Honestly, I’m more likely to freeze than to act boldly, but in either case, I can’t move forward until I confront whatever is holding me back—fear of failure, lack of trust in God to see things through, prioritizing my own comfort over the needs of others. Here’s the good news: God has a history of using cowards and giving second chances. Most of us know the story of Peter, Jesus’ disciple. When Jesus was on trial and about to be crucified, Peter hung around. People recognized him and asked if he was one of Jesus’s disciples. He denied it not once, not twice, but three times—all within a day after he told Jesus he would never deny him. It’s easy to understand the fear behind his denials—after all, Jesus was about to be killed. But Peter knew it was betrayal, and he wept. Later, after Jesus rose from the grave, he asked Peter three times if he loved him, and he instructed him to be a leader—”feed my sheep.” He also predicted Peter’s martyrdom (John 21:15-19). Peter backed down in the past, but he had many more opportunities to boldly proclaim the truth, in the face of ridicule and death. When I lack courage, I find it’s best to write out my fears and weaknesses and examine them in light of Scripture. I also pray that that God would guide me, use me to bless others, and use me for his glory as I go forward. When it’s about him instead of me, I have less reason to fear failure. I know my relationship with God has nothing to do with my merit, and I know that he treasures me. I know he can use my mistakes—I’m more compassionate because of them, and perhaps my mistakes will help others gain perspective about their own. Here are some verses I’ve found valuable to study and meditate on. This is far from an exhaustive list, but it’s a start. Fear is often based on lies and doubt. Boldness comes when truth and faith win out. On being made new and/or molded according to Christ’s likeness: Romans 8: 26-30, 2 Corinthians 5:17-21, Colossians 3. Salvation and reconciliation is not based on performance: Romans 3:21-31, Ephesians 2:1-10. I encourage you to learn about and meditate on God’s grace and truth. Rely on his strength. When you do this, I think you’ll find more and more that you can step forward boldly despite your weaknesses, much like Ennoshita is beginning to do. Annalyn, known to the offline world as Alexis, is a lifelong lover of fiction. Growing up, books kept her attention, but anime stole center stage halfway through high school. If she isn't consuming, writing, editing, or thinking about some form of story... she's probably distracted. But she might be dancing to K-pop, working, or hanging out with family. Whenever we have felt fear, then wouldn’t it make sense that we are not as in-sync with God as we should be? This has made me revaluate my relationship with Christ, and shows me that I don’t depend on God for as many things as I should. So I’m learning to fully surrender myself, carrying my cross daily, and follow Christ to the end of myself. As Jesus said himself, following Him is very easy, having a light burden, but the process is extremely painful. I’m trying to take my healing one day at a time, shining my fear and doubt in the light, and choosing Christ above all else. Sorry for my random rambling, but I’d thought that I’d share that. I’m not near perfect, but I depend on a God that is, and my soul is put at peace. Who nose (hehe Doctor Who reference), maybe this will impact someone else in a positive way. Micah, thank you for sharing this. What you call “random rambling” here could indeed encourage someone who is going through something similar. Fully surrendering ourselves to God and giving over our fears and doubts is a daily challenge, and I think your experience with addictions gives you another, deep perspective on that. I think a different translation of 2 Timothy 1:7 actually came to mind briefly while I was writing this, but I was low on time, so I didn’t look it up. Thank you for sharing! One of the things I’ve heard said before is that we are told to boldly obey and follow the Lord, the results are up to Him. When we boldly do what we are called to do, He’ll take care of it. We may only see it in inches, not miles, but things are happening. Great post, Annalyn. Thank you, Matt! Boldly obeying, in faith that God will take care of the rest, is something I need to work on regularly. I love the way that God uses broken people to accomplish mighty things. Gideon is another good example that I was reminded of when you mentioned Peter. Gideon is hiding in fear when God first calls him a “mighty man of valor.” At the time, it doesn’t make sense, but God sees Gideon for who he becomes in His plan, not as the person trembling in the past. I think God’s omniscience is something I often forget about–as do a lot of Biblical figures, it would seem–in that He knows my end and my beginning and He has a plan for me. He sees me as perfect and whole in Christ, and knows what role I play in His history. And, truly, that’s something that should give me courage when I feel I’ve failed beyond reconciliation. Excellent points on Peter & Gideon. The Bible is filled with flawed, broken people who the Lord used powerfully. It serves as a great reminder of how He can (and will) use us. The Alpha & Omega knows our beginning and our end – as you said. Well put. Thank you! I’m not as familiar with Gideon’s story, so that example never occurred to me. I’m glad you brought him up. I thought about King Saul as a second Biblical example of God using someone who acted cowardly (he hid when Samuel was trying to appoint him king), but given the way his story ended, I decided he’d require too much explanation. Gideon is much better example. I remember when I first decided to accept Christ into my life. I grew up in a Christian home, but or many years was angry towards this God I heard about at church, because I didn’t know how, if He loved me, He let me be bullied so badly at school (to the point where I decided in grade 6-7 I just wanted to be dead so it stopped hurting). I didn’t know how people could follow a God who “loved them” but let bad things happen to them. Backtracking a few episodes from this post, my struggle I think was more comparable at the start to Tsukki’s. I just couldn’t put my heart into something I was still struggling to understand, but, like Tsukki, I kept up the act (church every week, devos with my mom, etc.) and kept playing along as if I were part of the team – but it was robotic and meant nothing. In fact, inside it was causing a lot of turmoil, just like with Tsukki. But, like Tsukki had his “aha” moment where the robotics became a conscious choice driven by effort, so did I. I never pinpointed it, but it led me to, in grade 10, be baptized and actively start following Christ. It was from that point on my journey became a little more like Ennoshita or Yamaguchi and sometimes even Tanaka. Like Ennoshita, I felt like I hadn’t quite found my place in the team (sometimes I still feel like that). Like Yamaguchi, my past failures and mistakes would rise up to haunt me, causing me to play things safe when I shouldn’t have, and causing me to become frustrated with myself when 20/20 hindsight called me a coward. Like Tanaka, I sometimes felt that my attempts to contribute to things at church, school (it was Christian), etc. would shut others down or end up backfiring and hurting them (even if it was as simple as them being hurt that my idea was chosen over theirs for an assembly or something). However, this article’s a great reminder that, like Ennoshita, we ARE a part of the team – we’ve usually been accepted and the only one alienating ourself is, well, us. Also, like Yamaguchi, we are going to mess up sometimes – but, we also each have a unique contribution (for him, his float serve, for us, our unique set of God-given gifts) and, though they may not always work out perfectly, that’s not an excuse to back down, because people are relying on us and we certainly can’t succeed if we don’t even try. Finally, like Tanaka, we’re sometimes going to hurt people on the same team as us – it’s an inevitable truth. However, wallowing in it won’t fix things – all we can do is make an effort to hold things together even better until they’re back up and at ’em. Next Post The Secret Stars of Anime: Invaders of the Rokujyoma! ?